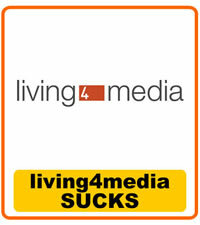 A letter came in the mail from a company associated with living4media. The letter was signed by the President/COO of StockFood America, Inc., Pete Eising, essentially accusing me of a copyright violation. It appears to be some type of form letter, as the text on each page is crooked. A disreputable company could send several hundred to a few thousand letters per week or month. The photograph that they claim is being infringed is a 60 x 63 pixel web page icon which was included in a website template I purchased about ten years ago. The company I bought the website template from includes the image with their template and their license does not state that the end user cannot use any of the included images. Apparently living4media is simply sending these scam letters to anyone they can find on the internet using these templates, threatening website owners with lawsuits if they do not pay StockFood America, Inc. $1,000. I did a simple internet search and it looks like this is a common scam perpetrated through living4media and the parent company StockFood America, Inc. by thePresident/COO Pete Eising.